I managed to get Google Earth, before downloads were temporarily suspended. The 3D terrain visualization is impressive, though high-resolution imagery is not available for many areas of Canada (the Rocky Mountains, for example). The software is very user-friendly and allows the image to be rotated and tilted and provides hours of fun. Google Earth is yet another winner from Google (though it would be interesting to see how they monetize all these free products). 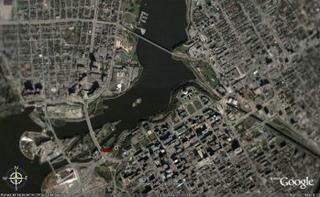 The image above is that of downtown Ottawa, showing the Parliament Buildings, Ottawa River and the Rideau Canal. Jonathan Chevreau, personal finance columnist for The National Post, reports on a study by Ibbotson Associates that shows that adding precious metals (gold, silver and platinum) to a portfolio composed of traditional asset classes “marginally improved the risk-return trade-off. The Ibbotson report was commissioned by Bullion Marketing Services Inc., which runs the Millennium BullionFund. Gold does have some value in diversifying a portfolio owing to its low correlation with paper assets (as pointed out in the study). However, the long-term return of gold has been terrible. In any case, the BullionFund is a poor way to get exposure to precious metals. The fund charges a commission of upto 5% and a MER of 2.75%. If we assume that precious metals just keep pace with inflation, an investment in the BullionFund will be down approx. 8% just in the first year. In 25 years, assuming constant real prices, the investment would be down 50% in real-terms. A (slightly) better alternative would be the GLD ETF (MER 0.4%) and the silver ETF that will be launched in the future. Around this time of the year, the right-wing Fraser Institute announces the arrival of Tax Freedom Day. They report that, this year, it falls on June 25, until which Canadians have been working to just pay their taxes. Recently, the left-leaning Canadian Centre for Policy Alternatives challenged the Fraser Institute’s numbers saying that the “calculations understate the income of Canadians, overstate their taxes and misuse the concept of averages”. The report argues that the Fraser Institute understates incomes and overstates taxes and thus makes exaggerated claims. The CCPA estimates Tax Freedom Day for a median Canadian family to fall on April 28. Since I keep extensive records of what I earn, spend and pay in taxes, I thought I’d use those numbers and arrive at my own conclusions. For our household income, I am including all employment income and all taxable interest, dividends and capital gains. I am excluding all contributions to retirement savings because tax is simply deferred. For our total tax bill, I am including federal and provincial taxes, an approximation of sales taxes based on our total annual household expenditure and property taxes. I am not counting motor vehicle license fees, gas tax, tobacco tax (I don’t smoke), liquor tax, amusement tax and a million other taxes, since the sales tax is probably overstated. I am also including CPP contributions and EI premiums as a tax, though it is debatable. Based on the above observations, I estimate Tax Freedom Day for our household to fall on April 13, much closer to the CCPA’s estimate. Some caveats though: our household expenses relative to our income is very low, so our sales tax bill is probably far lower than a typical Canadian family. We also contribute the maximum allowed to our retirement accounts resulting in hefty savings at our marginal tax rates.